The Mount of Olives is a mountain ridge east of the old city of Jerusalem with three peaks running from north to south. The highest, at-Tur, rises to 818 meters. It is named for the olive trees that once covered its slopes. 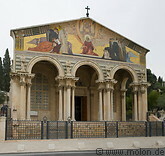 The Mount of Olives has a special significance in the Christian and Jewish faiths. Its slopes have been used since the 3rd millenium BC as a cemetery.